Dar es Salaam, Tanzania: Located in southern Tanzania on the coast of the Indian Ocean, Dar es Salaam is a bustling, chaotic place, filled with life and color. It is the largest city of Tanzania, and is the countries richest city and an important economic centre. Matobo or Matopos National Park, Zimbabwe: The Matobo National Park lies in the Matobo Hills, which are a 200 million year old range of granite domes, spires and unique smoothly-rounded balancing boulders created by years of erosion. The 424 sq km park is the burial ground for colonial imperialist Cecil Rhodes and his peaceful grave can be visited on the top of one of these outcrops of rock. It is also home to a diversity of wildlife, and has one of the largest densities of leopard in Africa, and considerable populations of both the black and white rhinoceros. The highlight here is a game walk to possibly get close to rhino on foot. Kruger National Park, South Africa: Spanning 18,989 square kilometers, the Kruger National Park is one of the largest game reserves in Africa, and is the premier game reserve of South Africa. Home to the Big Five, there are 147 mammalian species, as well as 517 bird species and 114 species of reptile. Lake Malawi, Malawi: Lake Malawi is one of the great African lakes, and is the south-most lake in the Great Rift Valley. The third largest lake in Africa, Lake Malawi is positioned between Malawi, Tanzania and Mozambique. It is the second deepest lake in Africa, and has reportedly the most species of fish on Earth. Ngorongoro Crater, Tanzania: The worlds largest unbroken caldera in the world, the Ngorongoro Crater is 16-19 km in diameter, has a crater floor of 26,400 ha and a rim soaring to 400-610 m above the crater floor. The formation of the crater is associated with the massive rifting which occurred to the west of the Rift Valley. It also has a population of about 25,000 large animals living in the crater, which makes game driving a true highlight! Serengeti National Park, Tanzania: The Serengeti is probably one of the most well known African Game Reserve. Located in the north western corner of Tanzania bordering Kenya and the adjoining Masai Mara the word Serengeti is derived from the Masai word meaning 'Endless Plain' and when you enter the Serengiti you can really see where the name came from. The Serengeti is home to the 'Great Migration' a wildlife spectacle as nearly two million herbivores cross the Mara River in persuit of the fresh grass after the rains. Victoria Falls National Park: Victoria Falls or Mosi Oa Tunya, the smoke that thunders sits on the border between Zambia and Zimbabwe where the Zambezi river drops 108 metres into the gorge. Victoria Falls, named after Queen Victoria are also known by their local name Mosi Oa Tunya, which literally translated means 'The Smoke that Thunders' referring to the coloumn of spray from the waterfall that can be seen from miles around. Victoria Falls is undoubtedly Southern Africa's adventure playground and some of the activities on offer are: Bungy Jumping; White Water Rafting; Canoeing; Microlight Flights; Helicopter Flights; ; alk with Lions; Walk with Elephants; Gorge Swing Your tour leader will be able to assist in booking on these activities and others too! Zanzibar, Tanzania: The Island of Zanzibar is a semi-autonomus part of the United Republic of Tanzania and lies 25 - 30 Kilometres off the coast and consits of numerous small islands including the two main islands Ugnja (informally referred to as Zanzibar) and Pemba. Zanzibar's main industry is spice exports, hence the name 'The Spice Island' that, along with tourism are the islands main income source. Zanzibar is home to fantastic coral reefs making for excellent diving and snorkelling, not forgetting beautiful white sandy beaches. Also not to be missed is the excellent and informative 'spice tour' where you will learn more about the island's interesting past. 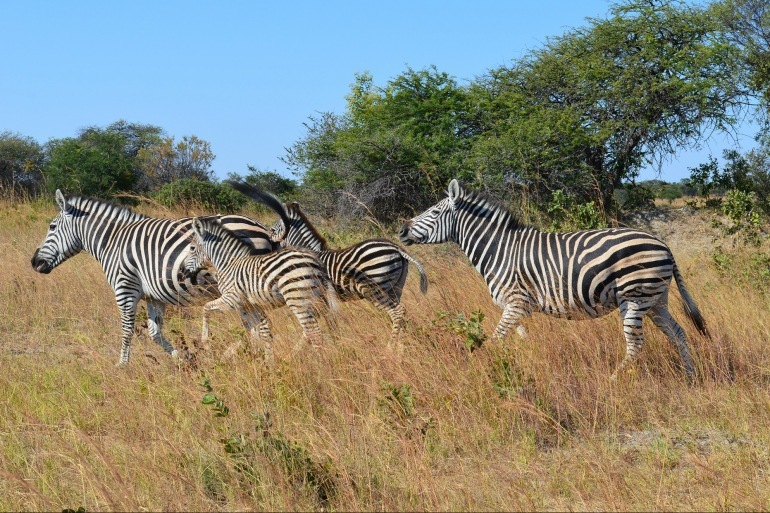 This overland adventure and beach safari tour offers the renowned Big 5 game parks, the friendly laid back beaches of Lake Malawi, the tropical paradise of Zanzibar, and the Victoria Falls. Its ideal for those wanting to see the best of Africa. No reviews yet for this trip. Browse other reviews below for Acacia Africa. From South Africa’s largest city, Johannesburg, we travel to the famous Kruger National Park. We search for Africa’s ‘Big Five’ - lion, elephant, buffalo, rhino, Leopard - and an immense variety of birdlife, a perfect introduction to Africa’s nature. Continuing north into Botswana, we pass through Francistown and Nata to Kasane and nearby Chobe National Park. On the famous Fish Eagle Cruise on the Chobe River we may see hippo, buffalo or elephant wallowing in the shallows. From Livingstone we continue north, passing through Lusaka en route to South Luangwa National Park for two nights where we enjoy a game drive. Moving on, we reach Malawi, the ‘warm heart’ of Africa. Passing through Lilongwe we reach the enormous Lake Malawi, Africa’s third largest lake, where we camp on sandy beaches, enjoy the swimming and meet the famously friendly locals. We continue along the lakeshore and into Tanzania. Travelling through some remote areas, we pass through Mikumi National Park before reaching the Indian Ocean coast and port city, Dar es Salaam. ‘Dar’ is Tanzania’s main commercial centre and the jump-off point for Zanzibar - the ‘Spice Island’! Time here is at your leisure. Rich in history, Zanzibar offers a blissful mix of exotic spice markets, winding alleyways and old palaces as well as sparkling, blue ocean and long stretches of palm-fringed sands. NB Basic shared accommodation is included on Zanzibar however meals will be for your own account allowing you to experience some of the many different options available on Zanzibar. Please refer to the tour dossier (available below) for more information. Back on the African mainland we travel back inland where, in clear weather, we may spot snow-capped Mt. Kilimanjaro, Africa’s highest peak (5895m), as we drive towards Tanzania’s safari capital, Arusha. Hold a snake - if you dare - in the Meserani Snake Park and make friends on a guided walk to the local village to learn something of Masai culture. From Arusha we transfer to 4x4 vehicles for an optional 3-day game viewing safari in Tanzania’s premier parks, experiencing close wildlife encounters in the deep basin of the Ngoronogoro Crater and the open plains of the Serengeti. We game drive through exciting scenery by day and camp out under the stars, listening to the sounds of Africa by night! We return to Arusha for a final day’s drive across the border into Kenya and finish our tour in Nairobi. Cancellation by You If You wish to cancel your booking You must inform the Company in writing (signed by the person who signed the original Booking Form) sending such written notification to Basement Unit, 23A Craven Terrace, London,W2 3QH. Cancellation will be effective on the day it is received by the Company. The following charges, in addition to your deposit and where applicable the gorilla and chimpanzee permit moneys, will be payable by You, depending upon the number of days prior to departure date when the Company receives notice of cancellation. a) All passports, visas, health certificates or other travel documents required for the holiday must be obtained by you. It is your responsibility to ensure that that these remain in order, and to meet any additional costs incurred (whether by you or by the Company on your behalf) as a result of failure to comply with such requirements. Any information or advice given by the Company on passports, visas, vaccinations, etc. is given in good faith but without responsibility on the part of the Company. b) No credit or refund is possible for any unused services included in the holiday price or Local payment. This includes where the reason for not using the services is due to illness or to disinclination, or to lost, mislaid, or destroyed travel documents, or for departing the tour early or before it reaches its final destination. c) You must obtain confirmed onward or return flight tickets prior to departure for Africa. The Company cannot be held responsible if you are refused entry to any country through failure to supply proof of onward travel. You must accept responsibility for reconfirming all onward travel arrangements. d) You are responsible for checking-in at the correct time. The Company cannot accept responsibility if you miss flights or tours as a result of late a check-in. e) You acknowledge that the nature of the holiday is expeditionary and adventurous, and that you will be visiting places where the political, cultural and geographical conditions present certain dangers, risks and physical challenges greater than those present in our everyday lives. f) It is compulsory that you have personal travel insurance. This policy must include a minimum cover of $3,62,892 for medical and repatriation expenses. g) You agree that during the holiday images, photos, or videos may be taken by other clients or Company staff that may contain you in part or in whole. You agree that these images may be reproduced by The Company and You grant perpetual, royalty free, worldwide, irrevocable license to reproduce such images, photos, or videos in any medium for promotion and publicity purposes.